Symbolic images designed to tell about the advantages of one sort or another or the state, people were already used in ancient times. This tradition continues today. As many centuries ago, there was not only the emblems of States, cities, and individual families. Think of a coat of arms for your family everyone can. Think about what you need coat of arms and where are you going to use it. Russian legislation reglamentary territorial coats of arms, and their creation and use is defined quite rigidly. As for the rest there are no rules, so to come up with anything. But if you come for the creation of the emblem, it should be according to the rules. Check whether in your family ancestors, the aristocracy who had the right to own arms. If found, feel free to use their emblems. No law that would define who can use the family coat of arms, and who is not allowed, not now. Think of your field of arms. The knights it was a shield. 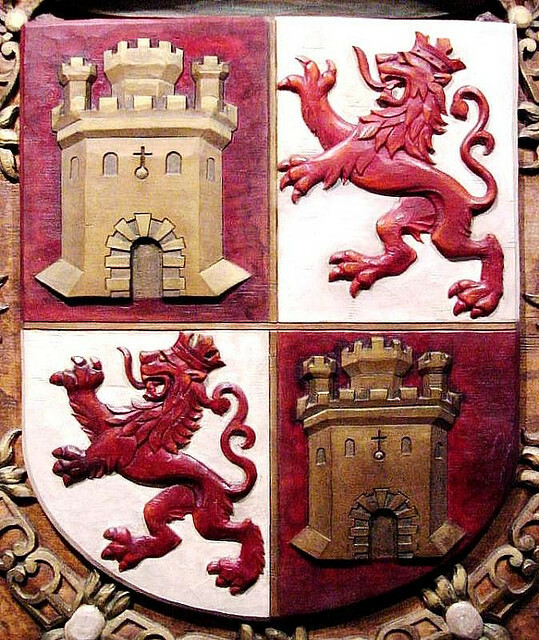 Typically, the shield is used in the coats of arms of cities. Role, the arms must also follow this requirement. But the family coat of arms is not necessarily. Field can serve as the subject who loves your whole family. Car, guitar, backpack — anything. You don't strive to follow strict canons. Can the basis of the emblem to take a geometrical figure. The family Council decide which characters will be present in your emblem. You might have to dig around in the family or even the state archives. Who were your ancestors? What tools or weapons are the most typical for their profession? What do the members of your family? Decide how many pieces will be the arms. If we are talking only about your family, including, for example, from two generations — maybe one part, which are arranged in a different order the right signs. But I can reflect in the coat of arms and origin of your family, dividing the field in two. One part represents a family of father, different mother. Determine the location of the signs. Decide which can be the connecting characters or lines. They are not required, but sometimes used. The emblem may still be the motto. It is better to have top or bottom. A motto is a short sentence that most accurately describes the owner of the emblem. Decide on color scheme. In classical heraldry uses seven colors. This is two metals — gold and silver, and five enamels of red, purple, blue, black and green. For role-playing emblem it is better to use this color scheme. More free family coat of arms colors can be arbitrary, but it is necessary that they are well differentiated. Make a sketch on the sheet. Position the symbols and the motto. Pour paint of the desired color of the field coat of arms and motto. Paint the characters. Draw their boundaries. Write a motto. The font with which you write the motto, should be easy to read from afar. His style should match the overall style of the emblem. Suitable for role-playing Gothic font family — any. Characters should not be too much, otherwise the emblem will be hard to read. If the symbol you are using animal or plant, no need to pay more attention to the details. You need the total picture so that it was clear to the audience. The coat of arms can be ordered and professional artist. But you should explain clearly what you want. After you come up with and draw a coat of arms, it is necessary to make a description. The coat of arms can be drawn and on the computer there are even special programs. But if you want it was the original - draw it by hand. Heraldry came to us from medieval Europe with its jousting tournaments, beautiful ladies and bloody wars. Coats of arms were depicted on the shields and it distinguished the knights from each other. Later coat of armss appeared on the clothing of the workers, as a distinguishing feature. Over time, coats of arms appeared not only noble knights, but cities, States, craft guilds. In modern Russia the coat of arms officially can only have the subjects of the Federation. A commercial firm can register a coat of arms, but only as a trademark or logo. If you create a personal, family coat of arms you can go three ways. Search. This method is suitable for those who have ancestors appear aristocratic personages. Each noble family had its own coat of arms, a poem, if you manage to find a noble ancestor, then you have every right to use his coat of arms. In modern law there are no conditions on what extent the family member can use the family coat of arms. The path of least resistance. 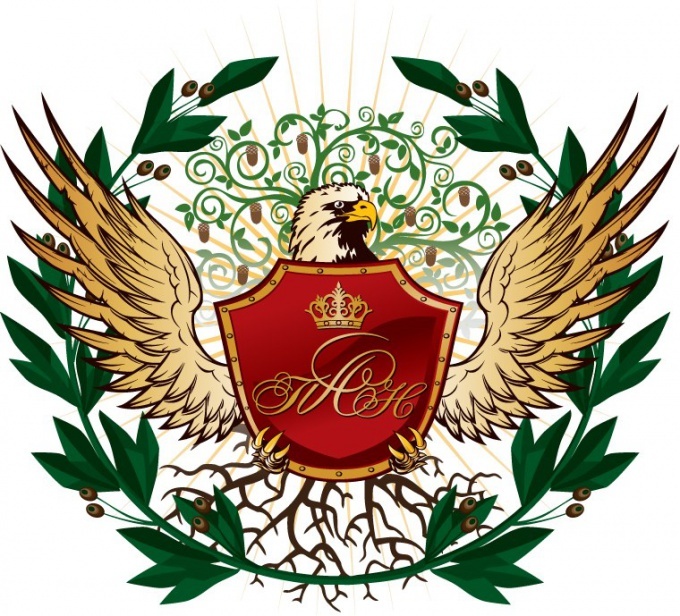 Contact a professional organization, which is engaged in creation of heraldry. Order them the emblem and it will draw all the canons. Find a company easy online. Just before you agree to the creation of your coat of arms make sure the firm is competent in matters of heraldry. Otherwise, you get just a beautiful picture, whose meaning will be incomprehensible to experts. The first rule is a combination of materials and colors. Only in heraldry used 7 colors. Two colors of metal: gold and silver. Five colors of enamel: green, blue, red, black, purple. If the background of the emblem is made of metal (yellow or white), it shall not impose other metal (white to yellow and Vice versa). The same applies to the enamel. An exception may be made if the coat of arms is divided into sectors. Remember the symbolism of flowers. Gold or yellow is the symbol of justice, generosity and wealth. Silver (white) is a symbol of innocence and purity. Red is bravery and courage. Blue – beauty, greatness, gentleness. Green – joy, abundance, hope. Purple – the symbol of power. Use only the royals. Black – humility, prudence and sadness. Before the coat of arms consisted of different parts. It consisted of a shield, mantle, helmet, crown, motto, siderately and so on. Today only use a shield with applied pattern. So first you need to draw the shield. On top of him applied the figure. Choose a figure that symbolizes the main occupation of your family. If you have a family dynasty of physicians, place on the shield is the symbol of medicine – snake with the bowl. If military, then on the shield is a weapon – sword, spear, and so on. If desired, place under the shield the motto of his family. It needs to be concise, it is desirable to make it in Latin. Coat of arms - a symbol of the unity of the genus, its place in society, reflecting the basic values of life and family priorities. The arms have a few, since it was originally considered an indicator of belonging to the nobility. Now, however, it can be just to perpetuate your family or to create a dynasty. Heraldry gives people the opportunity to Express their individuality. After all, the emblem is primarily the signs of the differences kind. Properly designed according to the laws of heraldry and the color coat will protect its owner, to unite the genus, giving it the hardness, resilience and bringing prosperity and success. You get a family coat of arms in several ways. Russia before 1917 was a mighty Empire, whose authorities were only people of noble origin. Each kind was a long story and of course, an attribute of the aristocracy - the family coat of arms. It's already after collectivization and dispossession have all become comrades and the proletariat. 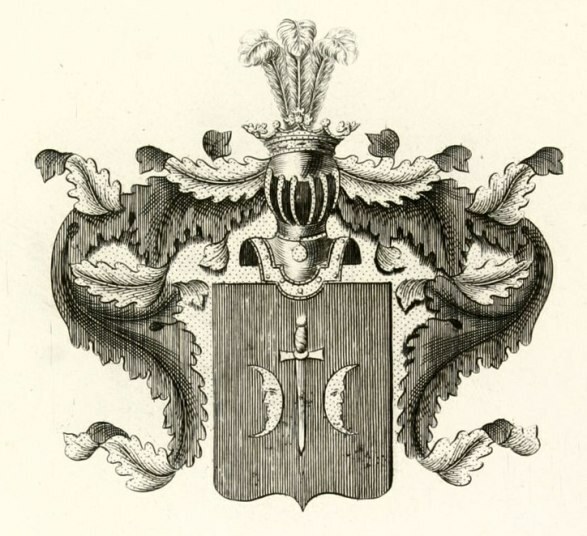 View your family archives - perhaps you are a descendant of an ancient noble family, which had its own coat of arms. Draw it and safely use it, because the laws about what degree of kinship are entitled to use the family coat of arms, long forgotten. 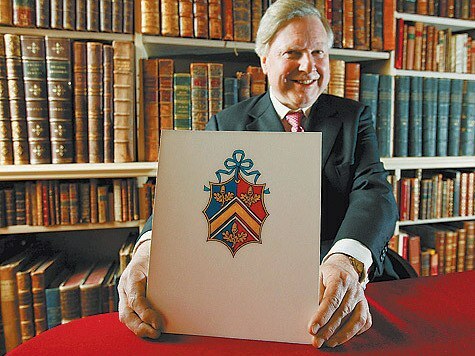 You can turn to experienced professionals involved in heraldry on a professional basis. You will be given the opportunity to fill out a psychological profile test, which will reveal features of your personality, Hobbies, significant events in the life of your family. Based on the data compiled sample which you'll be able to change and add certain elements. If you have a talent for drawing, can create his own coat of arms. Heraldry is a complex science with its own specific rules, so you will have to study the relevant literature. 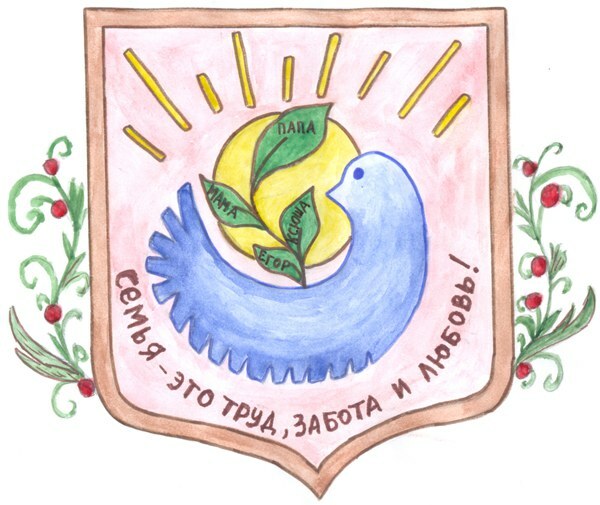 You can also find on the Internet a program that creates coats of arms, but your arms, in that case, there will be individual and unique, as in the database of this program is based on the limited number of elements. In medieval heraldry when creating a coat of arms used a wide variety of items. Today apply more laconic coat of arms, consisting mainly of the shield, drawing on it and having a ribbon of a motto. - a very important place in heraldry is a color. Used in all 7 colors: metals - gold and silver along with enamel red, green, blue, purple, and black. Purple is used in the making coat of arms for Royal families. - main color rule in heraldry - not to put metal on metal and enamel on the enamel. After you select the shield, dividing it, and the colors should start drawing shapes. They can be images of animals, plants, tools, weapons, buildings, construction. The arrangement of the figures is also determined by the special heraldic rules. Use these figures that will characterize your family, rod. The coat of arms can be supplemented by a ribbon with the motto. The motto may be some short aphorism or phrase that has special meaning to your family. The coat of arms is ready. Now we need to make it a verbal description, as one and the same figure in heraldry can have multiple values. The description will also be drawn up according to special rules specified in heraldic literature. The main characteristics of the coat of arms are its brevity and simplicity. It is a distinctive symbol which should be associated with its owner. The coat of arms is a family tradition that will pass from generation to generation. Now what other family can boast the family crest. But you can create your own individual coat of arms. It should be a emblem with certain symbols, which are described in heraldry. Family coat of arms represents the history of the family, his achievements and reflects the main priorities of the family. Draw a shield. Its form depends on your choice. The more complex the configuration of the shield, the more it fit the necessary heraldic elements. The most common shields in the form of a rectangle. Draw on the shield the sword can be placed in the middle. Perhaps the presence of the helmet, above the shield. On a Golden helmet claimed most ancient family of nobles, and silver helmets had a less illustrious family. Put on the helmet crest. This can be feathers, wings, animal, horn, armor and other items that characterize your family. The presence of a crest, as an auxiliary element, shows a common heraldic line. Select the color of the crest, it should fit the color of the shield. Don't forget to paint the mantle. This is a mandatory attribute of the coat of arms. It refers to a kind of protection. You can decorate the mantle with fur or tassels of Golden thread. Put on both sides of the future arms in the shape of heraldic animals (griffins, lions, eagles, angels). At the bottom of the logo position the platform is the base on which it will hold, for example, a pedestal of marble. Instead of Foundation you can use a tape on which to write a family motto. It can be any phrase or aphorism, of great importance for the kind. The ribbon color should match the primary hue of the coat of arms. Check your family archive. Maybe you belong to the descendants of the noble family, which had its symbolism. Then just redraw it and use it. An important role in heraldry have color. Usually used seven shades. For metal – silver and gold, and enamel green, red, blue, black and purple. The color purple is used in the creation of coats of arms of kings. In heraldry it is impossible to apply the enamel to the enamel and metal on metal. Family coat of arms is a special symbol that unites all representatives of the same genus. Several centuries ago he was given great importance today, create a symbolic image is optional. Look in the sources available to you information about the origin of the family. Perhaps you belong to the few nobility and your kind in ancient times had been the coat of arms. In this case, it can pick up and move to the modern materials, without making a new drawing. If you want to create a coat of arms with a clean slate, you must define the values of your family, her service to the society and distinctive characteristics. For example, if someone in your family designs military aircraft, the center of the figure you can place an image of a fighter. Consider what illustrations will be needed to accurately characterize these values. If you can't pick your own, ask for help to other family members, after drawing up the coat of armsand is a collective creativity. 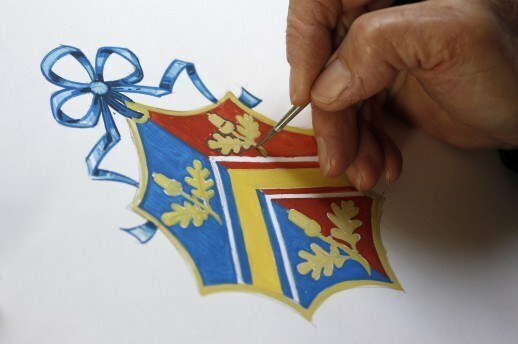 Learn the basic shapes that are traditionally used in heraldry, and stop at one of them. Its contours give the symbol of awareness, will not allow to confuse it with the other object of arts and crafts. Stop on a certain set of characters you plan to portray inside the shape. They should not be too much, to prevent an overabundance of small details that will create a feeling of some chaos. You can come up with any plot, and also to split the total field into separate sectors, each of which will be dedicated to one family member. Take a sheet of paper, transfer it a picture of the coat of arms. If you do not know how to draw, ask relatives or friends to help you. Paint the image. The resulting laminate arms – it needs to be solid, this will allow it to be well preserved for many years. Optionally, complete your coat of arms motto, which is typically written in a separate box below the main figure. It is a short concise phrase, and valuable to your family. In parallel, compose a few words about what is depicted on the coat of armse and why have you chosen these characters. Perhaps you decided to make a family coat of arms is the family Council, and, maybe, it was just a task given to the child at school. One way or another you will face a very interesting task. First you need to decide how you want to make your future coat of arms. If someone from family members is endowed with good artistic skills, you can arrange symbols manually, by drawing on a simple sheet of paper. In addition, such activities may include all nearby relatives - someone will apply contour, someone paint a picture, and someone to sharpen pencils. The most modern solution to make a family coat of arms design on the computer using special graphics programs (Adobe Photoshop, Illustrator, etc.). But, of course, have experience with similar software. Heraldry is a discipline dedicated to the study of coats of arms. It is generally accepted that the main shape of any coat of arms is the shield. Its shape can be almost any, but is most common triangular or French (like the bottom rounded rectangle). The inner space of the shield is called a field. It can be uniform, is divided into several parts and, consequently, of colors, or with a small figure (for example, Fleur de Lis, clover leaves, etc.). The next stage can be called the most creative - a shield superimposed on symbolic images. It can be both animate and inanimate objects. The main thing here is to decide what you want to reflect on your family crest. If you and your relatives are engaged in some common cause, for example, work cooks, it is more than appropriate to put on the coat of arms table spoon or toque. Maybe you have a speaking name (wolves, lions, Bulls) and want to reflect on the arms of her using any kind of symbol. The images on the shield may be several. It is important that they were all pointing in the same direction (rotation of the head, a pointer, etc.). In classical heraldry of the Middle ages was made use of in the arms of many other elements in addition to shield, helmet, crown, supporters, mantle, and others. In our time can only be restricted by the shield, placing it underneath the tape on which is written the motto of your family. An important detail in the coat of arms of the family are also color. Traditionally in heraldry, they are used all the seven: gold, silver (or their equivalents yellow and white), black, blue, red, green, and purple. The last of these at the same time the canons are allowed to use in the heraldic symbols of the Royal and Imperial families. But, if you wish to make a family crest for yourself and do not plan to pass it on from generation to generation, then this rule can be derogated from, and to give the figure any other colors at your discretion. 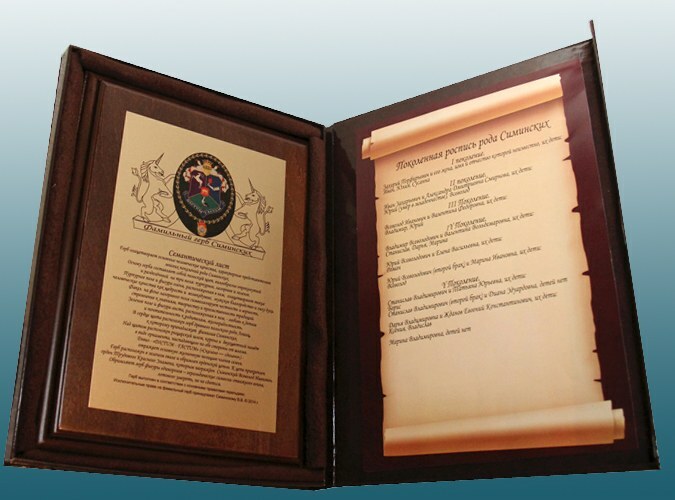 If you approached the creation of the family coat of arms according to the rules, in conclusion, it should be the so-called semantic list - a detailed verbal description of a picture t the interpretation of its individual elements.